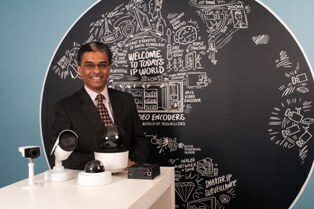 Axis Communications, the market leader in network video,is driving the shift from analog camera to digital surveillance, by tapping into the huge potential of the burgeoning Indian retail segment. As part of this commitment, Axis demonstratedtheir cutting-edge retail solutions at this year’s India Retail Forum held on5th to 6th Septemberat Mumbai. Attended by the who’s who of the retail industry, the India Retail Forum focuses on bringing the Retail Real Estate leaders for a knowledge exchange on the importance of building and sustaining for developersand retailers; and the emerging trends and opportunities in the real estate sector. According to PwC’s 19th Annual Global CEO Survey for retail sector,CEOs stated data and analytics technologies as their key area of focus. According to them, the new operating model will be customer centric, with data analytics at the heart of the decision-making process, enabled by appropriate technology and tools. Axis retail offerings helps retail players stay ahead of their competition and enhance their overall consumer experience. The integrated smart retail solutions displayed at IRF helps provide business intelligence to the retailers and optimize the store performance by making scheduled announcements. Established in 2004, India Retail Forum (IRF), is India’s premium annual event that brings together the retail brands to understand and learn the current and predicted trends in retail ecosystem. The event saw close to 1,500 attendees on day one and more on day one.